EveryCoin achieved a softcap on September 18, the first pre-sale period. EveryCoin's softcap is 19,000 Ether, which is considerably larger than other ICOs. But our softcap has been achieved with the continued interest and investment of many investors in the short term. The EveryCoin project has gone through a significant milestone for success and now has the foundation to successfully implement the remaining plans. Achieving Softcap will make our project more robust and attract more investors' attention and participation. The EveryCoin team will continue to strive to reward investors' trust and will complete this project successfully. We look forward to your continued interest and support. We would like to thank all investors who participated in private sales and presale. Now, EveryCoin has completed the first presale successfully, and the second presale has started on September 22. Participants in the second presale can get a 25% bonus by October 20th. We are pleased to inform you that we are upgrading the TabiPay System. 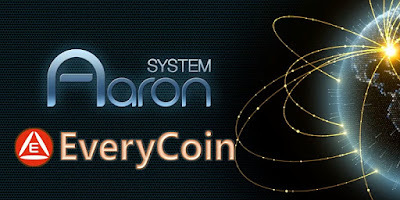 The Aaron Platform consists of EveryCoin(Fluid Value Coin), TabiPay(Stable Coin). and Eco-Chains. The TabiPay has these features. Anyone can easily create a free account. We deposit EveryCoin as much as the amount issued when we issue TabiPay. The 100% of the amount of TabiPay we sold will be cash deposited in the bank. TabiPay can be used anywhere in the world by issuing global cards through the partnership with card companies and banks. In TabiPay Wallet, you can exchange with EveryCoin, various cryptocurrencies and cash in real time. You can withdraw TabiPay at any time. These features are no plans for the future. The TabiPay system has already been developed and in use. And now the independently used TabiPay system has been upgraded to a new platform to run as part of the Aaron Platform. The new TabiPay system will work on a Linux server like the Aaron Platform, and a new interface will be built internally to support the multi-block chain of the Aaron platform. It means that the TabiPay system will increase its stability, speed, and future scalability. And it also means preparing for linking with EveryCoin. The upgraded version of TabiPay will increase the number of users and the demand for EveryCoin. We will announce a new TabiPay system soon after the final test. The most critical issues of cryptocurrency ICO in recent years is finding models that are capable of continuous demand and distribution. However, most ICOs are failing to secure their customers with poor user numbers and inconvenient usage. EveryCoin has 100,000 users of TabiPay. TabiPay is a fixed value currency that can be settled, remitted or withdrawn at any time. 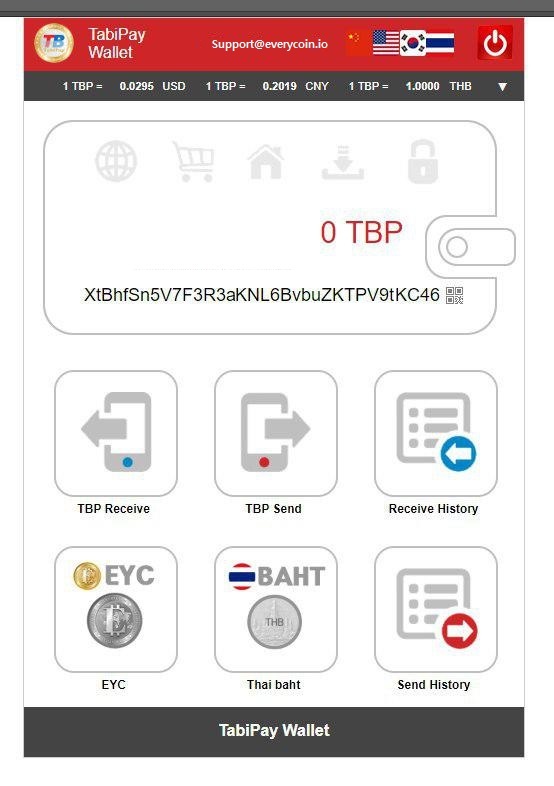 EveryCoin works with TabiPay as a multi-block chain. In other words, as the use of TabiPay increases, the demand for EveryCoin increases. 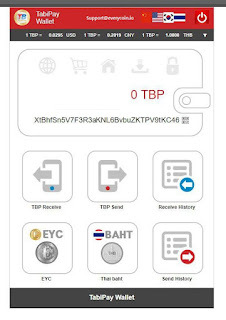 EveryCoin can link various block chains in addition to TabiPay also. The Aaron Platform has an Eco-Chain System that makes it easy to publish and use new block chains. The Eco-Chain System provides the tools for creating block chains easily. Generated block chains can be associated with EveryCoin in the same way as TabiPay. 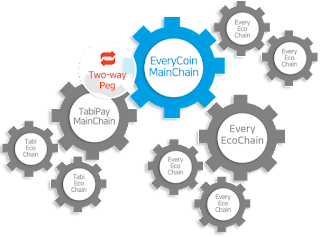 These Eco-Chains will become EveryCoin's Side Block Chain, increasing the demand for EveryCoin. On a Multi Blockchain, TabiPay and Eco-Chain will continue to increase the number of users and keep increasing the demand and value of EveryCoin. The Aaron Platform is a new financial platform that combines stable coin(TabiPay) with fluid value coin(EveryCoin) to solve the problems of blockchain speed and high variability of cryptocurrency. We have redefined financial services and changed the paradigm. Financial service will be transformed from a previous strictly graded, exclusively centralized systems to a decentralized, comprehensive and scalable systems. The first, by creating an unrestricted financial system, we make everyone in the world can receive the benefits of financial services for free. The second, everyone in the world gets out of the existing financial framework and will be able to open and use new financial accounts free of charge. And Fiat currency, Cryptocurrency, and Digital currency can be exchanged one another conveniently. Established in the USA in 2014, Aaron System has around 100,000 members in USA, China, South Korea, the Philippines, Vietnam, and Thailand. The company develops and operates "TabiPay" system and has recently launched the newly-developed system. Early this year, the company completed the development of the blockchain technology for Aaron platform and established Aaron System Company Limited in Thailand.